1. Combine all ingredients in a pan. A nice stainless steel one works wonderfully. 2. Stir over low heat, constantly until ball forms using a heavy duty spoon. A spatula will be harder to use as the doh thickens. Kids love to help with this part, until their arm gets tired! 2. 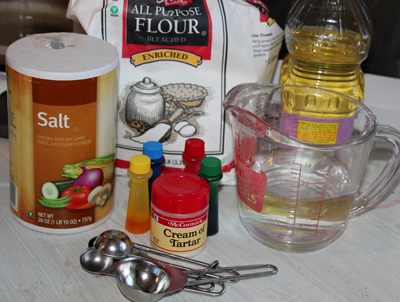 Remove from heat and add a couple of drops of food coloring and mix thoroughly until desired color. You can omit this part if you worry about dyes either in your carpet or on your kids! You may need to allow the ball to cool and hand kneed a tad before the colors are mixed equally throughout. 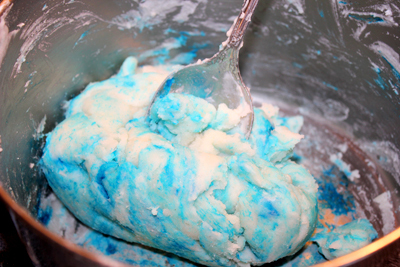 We love the warm feel on our skin and love to watch the colors transform together as we squish the dough! Cream of tartar can be a tad tricky to find at times, but rest assured, it is in the baking section of most grocery stores. 3) Put a vinyl tablecloth or other drop cloth under kids seats at the table. We have a dedicated kid craft/mess table so we play there. If you do happen to get dough in your carpet, don’t freak! This is the biggest thing with this dough… it will dry out… but you have to let it dry out. DON’T get it wet or use a ton of products on it. Because it is basically flour and water, you can simply use your nail or even a little fabric brush on the carpet after it dries out to loosen it. Then simply vacuum. At least that is the case in my experience. Your results may vary! Hand rating: I make this recipe with my 4 and 6 year old on a regular basis. They love to dump and measure, but it does make a mess that way with the flour! Because of the stove use and measuring required, its a 5 hand project, but it sure is a lot of fun!